The PsNee modchip is a newer chip that has been under development during the last couple of years, and is still under active development. PsNee modchips should work with every version of the PlayStation 1. They can be made using many AVR processors, including the Arduino Uno, Arduino Pro Mini, ATtiny85, and ATtiny45. 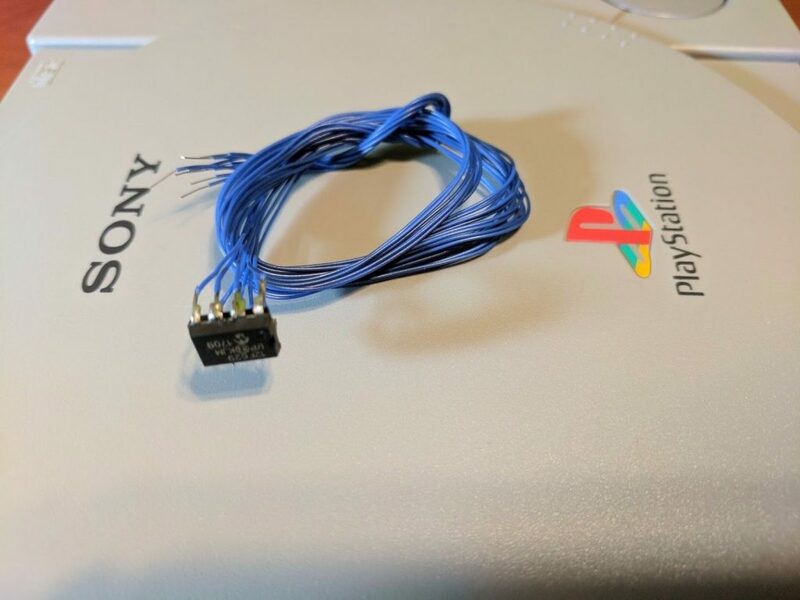 This guide covers everything you need to know about choosing, programming, and installing a PsNee modchip into your PlayStation. This guide is structured into several pages. It’s organized like this primarily so that comments can be more organized and useful for readers. This page covers the PsNee modchip. It includes general information about the chip, and then links off to installation guides for each console model. If you want more information about PlayStation 1 modchips in general check out this guide. Below is a list of all PlayStation 1 motherboard versions, along with the console model numbers associated with them. You can get a good idea of what board you have by looking at the model number underneath your system (something like SCPH-7501). To actually know what board you have you’ll most likely have to open up your console and look for the board version printed somewhere on the board (something like PU-22 or PM-41). Once you know what board you have you can click on the board model and you’ll be sent to a page with the installation diagram. The biggest problem with PsNee chips is that they aren’t very well documented (in terms of things like installation diagrams for every board revision). They also can be hard to find for sale. This guide, along with my store, will help alleviate both of these issues by providing installation diagrams, and a place to purchase the chips. The greatest strength of the PsNee modchip is the fact that it’s much more modern than PIC based modchips. Using AVR chips means that programming a PsNee chip is much easier, and many people may already have something like an Arduino which can be used as a PsNee modchip. Using more powerful processors allows the modchip to work with American, European, and Japanese PlayStation 1’s with a single chip, no need for a version for each region. It can even patch the SCPH-102’s BIOS to allow playing imports (previously this was only available with the OneChip). Note that this BIOS patch only works with ATmega based PsNee chips. Going forward PsNee modchips will likely become the new standard modchip, especially as the PIC12C508A chip used for more popular chips like the MM3 reaches end of life. These chips fall into two categories, ATmega based chips, and ATtiny based chips. ATmega chips cost more, but allow for BIOS patching for SCPH-102 systems, as well as debugging for developers. ATtiny chips cost less, but lack those two features. ATmega chips are also considerably larger in size, making them more difficult to fit into a system when compared to the ATtiny chips. I’m currently working on developing and testing modifications to the PsNee code to support full BIOS patching functionality with some of the ATtiny chips with more than 8 pins. The source code is available on the PsNee Github page. It can be compiled very easily using the Arduino IDE. All PsNee chips I sell are preprogrammed. I sell preprogrammed PsNee modchips on my store. The shipping is calculated by weight so if you buy more than one chip at a time you’ll be able to save some money. I also sell these same chips at a slightly higher price on my eBay store. Where can I get premodded systems, or have my console modded? I sell both premodded PS1’s, and PsNee modchip installation services on my eBay store, as well as my store on this website. On my store you can select which chip you’d like, and which model of console you’d like. On my eBay store I use a single product listing for every model of console and every type of chip, and update the title and description to reflect what is currently for sale. More information is available on the linked listings. I installed the TL866 Minipro Software on my computer and it does open the ino file for PSNee, but do I install it directly or do I have to install Arduino IDE in order to extract it? You have to compile the PsNee .ino with the Arduino IDE, and then take the .hex from the build output directory and flash that. You also need to disable the clkdiv/8 fuse (all the other default fuses should be fine). I’m not sure how to do that, and I don’t own a Arduino Board. I only installed the software but I keep getting an error. You shouldn’t need an Arduino board. You need to install the ATtinyCore in the boards manager, select the chip you are using, and compile it using the verify button. If you did end up installing it then it should show up in Tools->Board. Did that. Getting Error Select a board. You have to configure which version to use in the source code by uncommenting one of the define lines. I guess it worked as I have a hex file now. Thank you. Yes, for the ATtiny version.